In this article, we’ll look at how to update Angular projects to the latest version. This article is part 6 of the SitePoint Angular 2+ Tutorial on how to create a CRUD App with the Angular CLI. 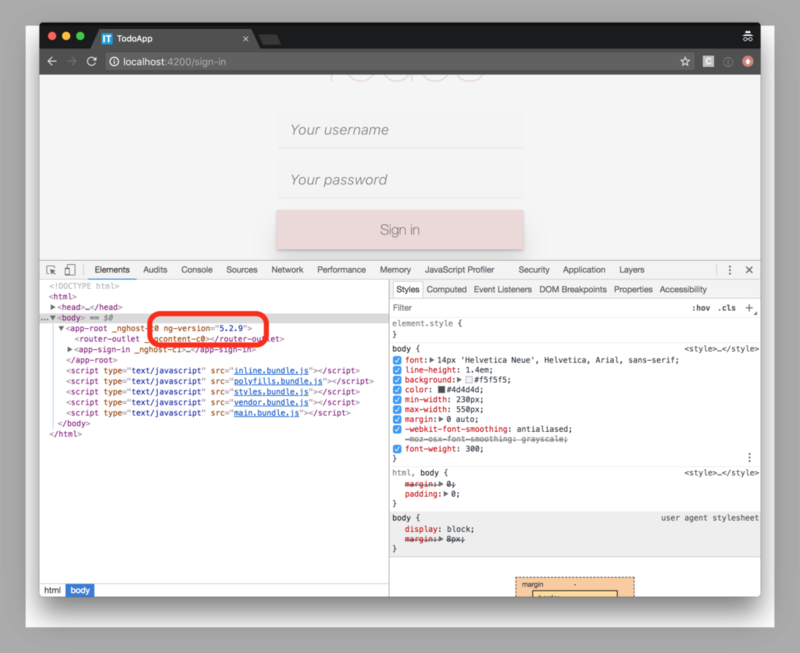 In part 5, we added authentication to our application and learned how we can protect sections from our application from unauthorized access. Don’t worry! You don’t need to have followed part 1, 2, 3, 4 or 5 of this tutorial for 6 to make sense. You can simply grab a copy of our repo, check out the code from part 5, and use that as a starting point. This is explained in more detail below. After that, you’ll need a copy of the code from part 5. This is available on GitHub. Each article in this series has a corresponding tag in the repository so you can switch back and forth between the different states of the application. The code that we ended with in part 5 and that we start with in this article is tagged as part-5. The code that we end this article with is tagged as part-6. how to update our code from Angular 4 to Angular 5 (Angular 5 being the latest version at time of writing). how to figure out which code changes are required (if any) for Angular 5. To support a thriving ecosystem, Angular needs to be both stable and evolutionary. On one hand, Angular aims to provide developers with maximum stability for mission-critical applications. On the other hand, it constantly needs to adapt and advance to support the latest changes in web technologies. Therefore, the Angular team has decided to use a time-based release cycle with semantic versioning. A time-based release cycle means that we can expect new versions of Angular (Angular 5, Angular 6, Angular 7, etc.) every couple of weeks or months. Semantic versioning means that the version number of Angular allows us to predict whether or not it will break our application if we upgrade to it. In essence, a semantic version looks like this: Major.Minor.Patch. So version v1.3.8 has a major component with a value of 1, a minor component with a value of 3 and a patch component with a value of 1. When a new version is released, the new version implicitly indicates the type of change that was made to the code. Each increment happens numerically with an increment of 1. If you’re not familiar with semantic versioning, make sure to check out this simple guide to semantic versioning. The release schedule is not set in stone, as there may be holidays or special events, but it’s a good indicator of what we can expect in terms of upcoming versions. You can follow the official Angular blog and the official change log to stay up to date on the latest developments. A huge benefit of semantic versions is that we can safely update Angular applications with patch or minor releases without having to worry about breaking our applications. But what if there’s a new major release? We already learned that a major release can come with breaking changes. So how do we know if our existing application will break or not if we update it? One way would be to read the official change log and go through the list of changes. For our Angular Todo application, we wish to upgrade from Angular 4.0 to Angular 5.0. We get a complete overview of all the steps we need to take to update our application. The Before Updating list contains 12 items. None of the items apply to our Angular Todo application, so we can safely proceed to the next step. If ng serve fails to start, try deleting your node_modules directory and package-lock.json file and run npm install to recreate a clean node_modules directory and package-lock.json file. The Angular Update Guide tells us that we should switch from from HttpModule to HttpClientModule. If we inspect the Angular version 5.0.0 release notes, we learn that Angular 4.3 and later ships with a new HttpClient that automatically handles JSON responses and supports HTTP Interceptors. It states that, to update our code, we must replace HttpModule with HttpClientModule, inject the HttpClient service and remove all map(res => res.json()) calls because the new HttpClient automatically parses JSON responses. Next, we must use the HttpClient service instead of the Http service and remove all map(res => res.json()) calls in our code because the new HttpClient automatically parses the responses for us. In part 3, we centralized all HTTP related code in a service called ApiService, and we now reap the benefits of that approach. We replace the old classes from HttpModule with their new counterparts from HttpClientModule. and navigate our browser to http://localhost:4200, we see that our application still works as expected, but now uses the HttpClientModule behind the scenes. Time to tackle item 2: import RxJS operators from rxjs/operators and use the RxJS pipe operator. Angular 5 was updated to use RxJS 5.5.2 or later. they are plain functions so we can easily create our own custom pipeable operators. The .pipe() method reduces the impact on our code to a minimum. We have two items in our application that need to be refactored: our ApiService and TodosComponent. We import the map pipeable operator from rxjs/operators and update all occurrences from .map(fn) to .pipe(map(fn)). Again, we import the map pipeable operator from rxjs/operators and update .map(fn) to .pipe(map(fn)). That’s it! The chained operators in our application have been replaced by pipeable operators, just as the Angular Update Guide instructed us to. If we navigate our browser to http://localhost:4200, we see that our application still works perfectly. Angular adds an ng-version attribute to app-root with a value of the version it’s running. We see ng-version="5.2.9", indicating that we’re running Angular 5.2.9. Mission accomplished! Our application has been successfully upgraded to Angular 5.2.9. We covered quite a lot, so let’s recap what we’ve learned. how the ng-version attribute lets us verify which version of Angular we’re running. In upcoming versions, Angular CLI will introduce the ng update command to help update Angular applications. As soon as more details are available, we’ll provide you with a follow-up article on how this new command can make our lives even easier. 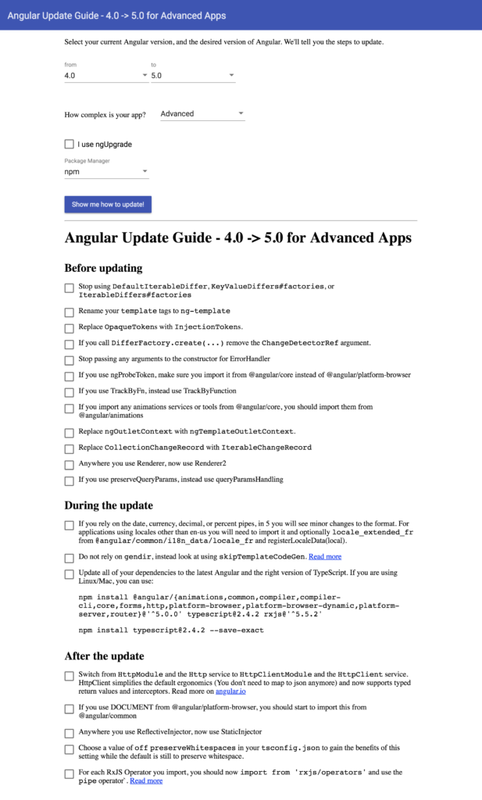 Until then, you can use this article as a guide on how to update Angular applications to the latest version. All code from this article is available on GitHub.